The autumn term has been a very busy one with full workshops, additional workshops requested and delivered and a waiting list for everything. The most exciting news is the arrival of an “ALBION” press in the studio by the New Year, fingers crossed all goes to plan. An eight week course looking at Introduction to monotype, multi coloured relief printmaking with reduction lino and mountboard cuts. A regular Thursday morning Print Club, small group working in a relaxed and friendly atmosphere, looking at different print techniques. Students taking three terms will be offered the opportunity to exhibit in Church Street Gallery, Saffron Walden, later in the year. 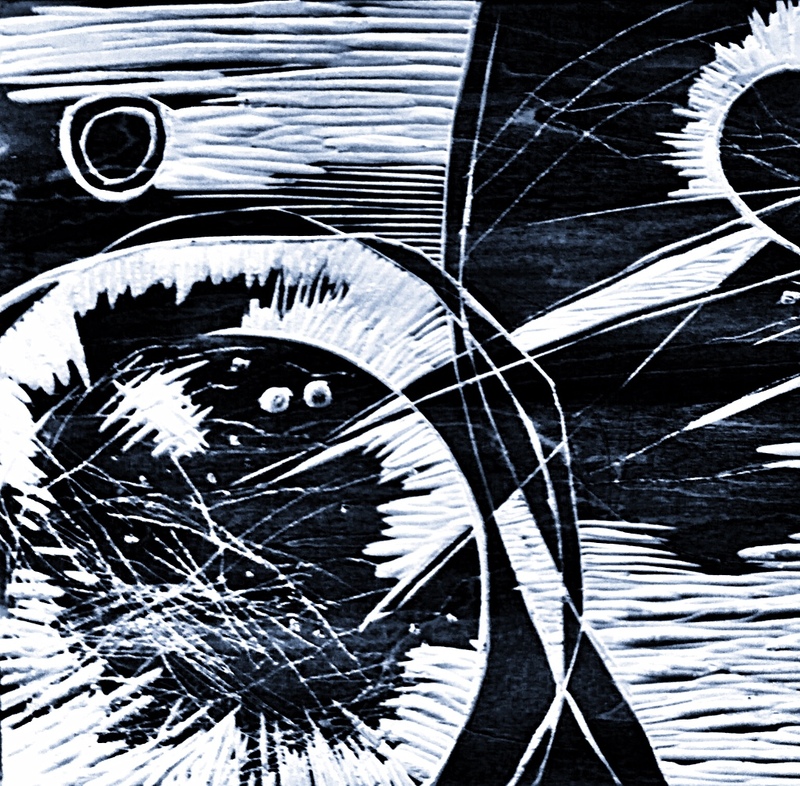 Advance your relief printmaking skills with the reduction technique. Learn how to plan, cut, register and print multi coloured images from a single block. 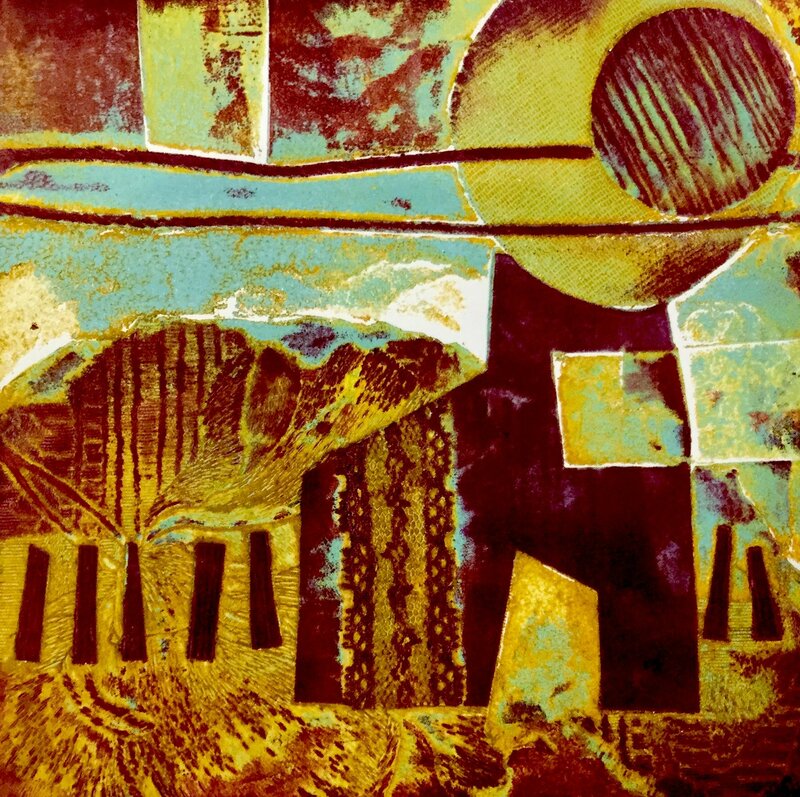 Enjoy a busy two days extending and developing your relief printmaking knowledge. Previous knowledge of relief printmaking a help but not a necessity. Edel is back by popular demand! Create a beautiful clam shell box with Edel Handmade Books to store or present your lovely prints in. Can be used to sell a series of prints, store tools or give as a gift. Bring your old prints to line or cover your box with your own personalised papers! Explore traditional monotype techniques. Looks at transfer drawing requiring no press, the subtractive/reduction and painterly methods. Experiment with layering, masking textured surfaces and combining techniques creating lovely unique images. Suitable for beginners and those wishing to refresh their knowledge. 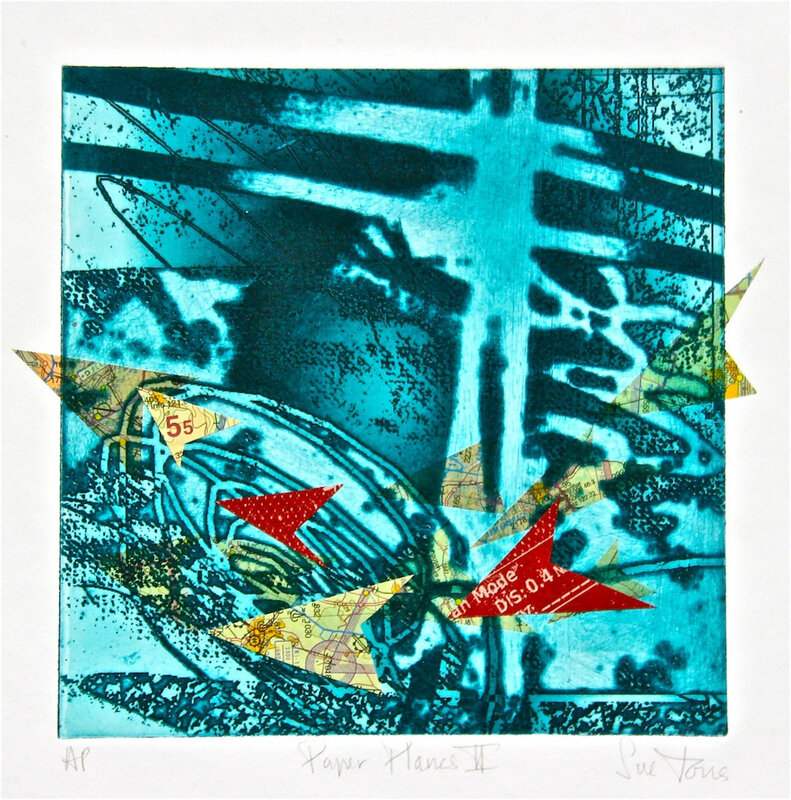 Explore the possibilities of textured surfaces and found objects to produce monotype prints. Create ghost or shadow prints, layer, use of masks and pochoir to produce beautiful unique images. 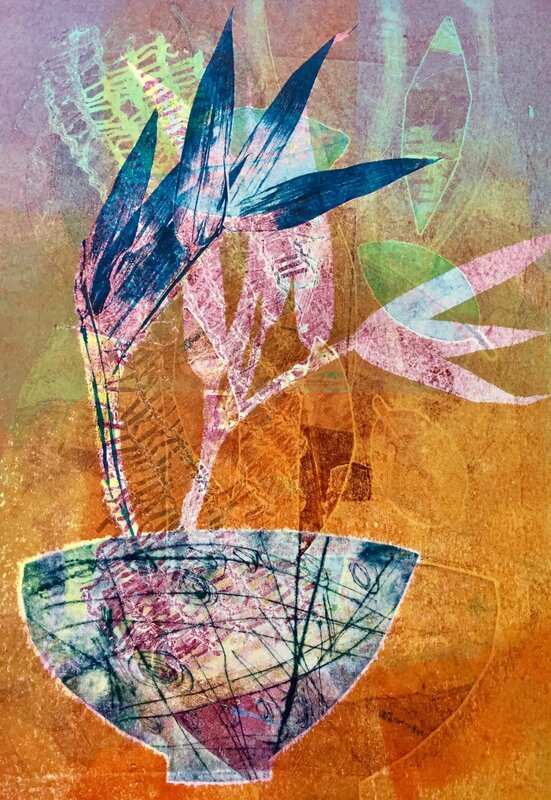 Combine with drypoint to build eclectic beautiful unique hybrid prints. A fun experimental day that makes you look at the objects around you in a new way! Suitable for beginners and those wishing to refresh their skills. with Edel Hopkins a master bookbinder. This 5-structure series, completed over 3 days, is designed to give you a comprehensive introduction to the basic skills of bookbinding. You will make four different bindings – case bound, quarter bound, concertina and stab stitch – as well as a lined slipcase in which to store your ‘prototype’ collection. The styles are carefully chosen so that they each represent a finished project or can be ‘mixed and matched’ to provide a myriad of creative results ensuring you are never again short of a notebook or gift! Print with no ink to produce images that rely on light and shade to create soft subtle images. Learn how to create collagraphs suitable for blind embossing and multiple ink viscosities. Experiment with one, two and three different Ink viscosities for exciting multi coloured collagraph prints. Print intaglio and relief. Suitable for those wishing to further their skills and those new to collagraphs. Learn how to create collagraphs suitable for blind embossing and multiple ink viscosities. Experiment with one, two and three different Ink viscosities for exciting multi coloured collagraph images. Print intaglio and relief. Suitable for those wishing to further their skills and those new to collagraphs. ghost prints, counterproofs, masking to build beautiful unique images. A fun 2 day workshop, no need to prepare anything, come along with a Concertina sketchbook (Seawhites/Amazon) and develop your sketchbook pages in a beautiful supportive environment. 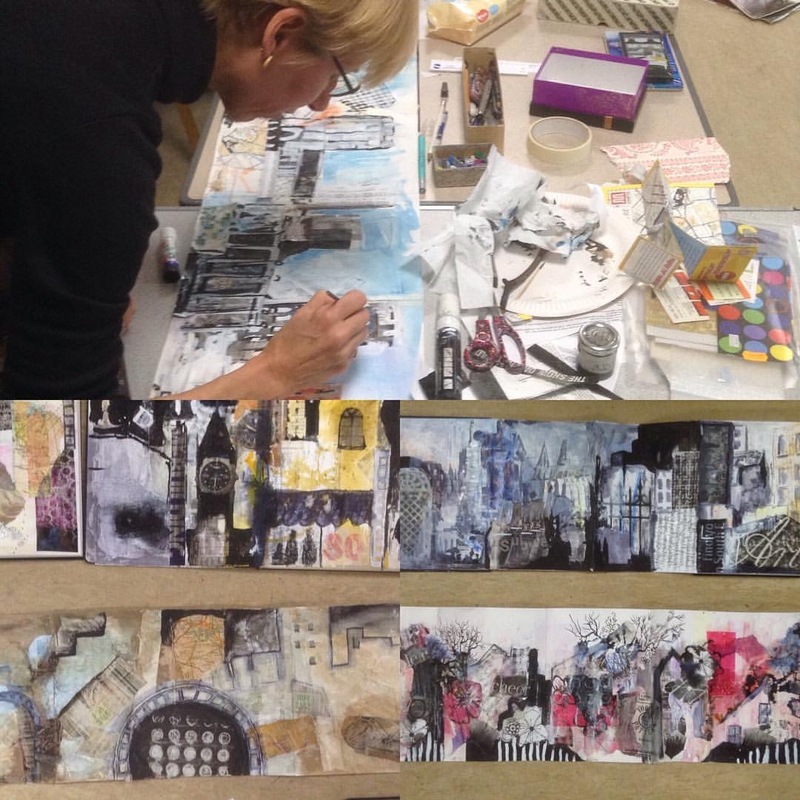 Day 1 – Work with inks, pencils, collage, with mark making and layering . Day Two – Sketch around the farm and beautiful countryside at Pinkneys Manor onto prepared pages, moving in and out of studio as needed. An introduction to UV light sensitive photoplymer plate. Requires no chemicals. Ability to print both Relief and Intaglio image. Use your photographs, drawn images or found objects. Can be exposed in the sun, weather permitting. 2 x A5 plates provided. Additional plates available to buy from the studio. 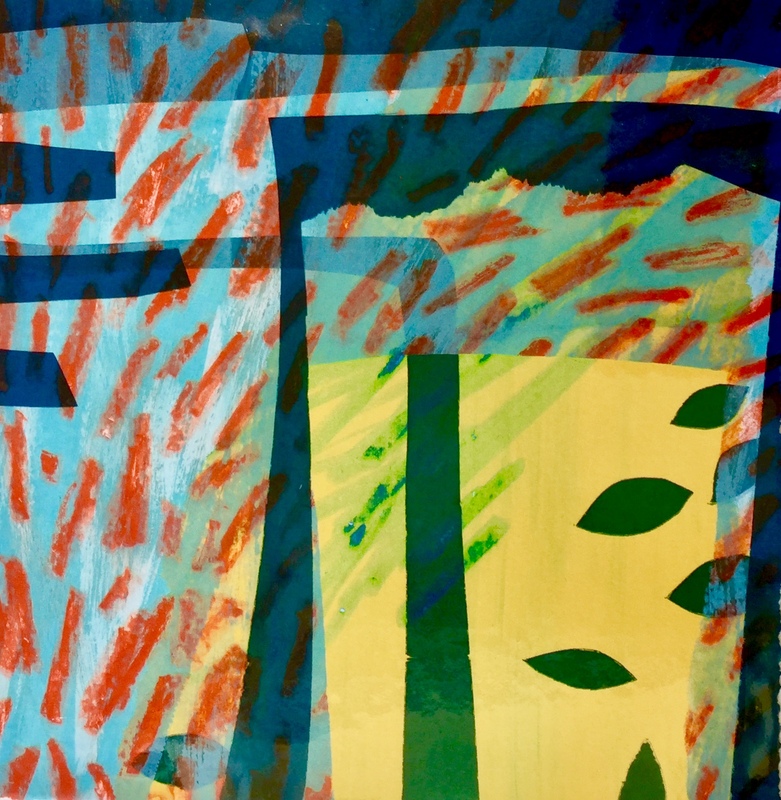 An introduction to water based Screen Printmaking with the use of paper stencils, layering of transparent and opaque colour, Monotypes with the painterly technique, and water soluble crayons. All techniques can interact with one another and can easily be recreated in a home studio. Please contact Sue for dates and availability.